If you are looking for an intercultural exchange, I advise you to overlook this one. USIPP goes way beyond the commonly found undergraduate summer exchanges, for it is not just a matter of cultural differences that are being higlighted, but also the very core of it–faith. Skip through this posting if you don’t think you will be able to handle intensive lectures and discussions on politics, history, and of course, religion for four weeks non-stop, morning til evening. If, however, you the condition I described is perfectly what you’re looking for, then I highly encourage you to apply for USIPP’s upcoming program (if any) as I did for USIPP 2016. Good luck! Let me start by saying that USIPP is not your typical undergraduate summer exchange program. For about four weeks, from May 29 til June 30, I, and 11 other delegates from universities both in United States and Indonesia, had experienced lots, literally. We have gone through many borders, nationally and internationally, met a number of religious leaders in both states, had discussions with historical actors, visited many monuments and museums, and of course, had numerous discussions. And believe me, not all of those things can be deemed as fun. It was extremely exhausting for all of us, physically and mentally. The committee said that the focus of this program varies every year, according to the participants, and for this year, all of them opened up personally on their beliefs. I can simplify this by saying that it is more of an interfaith program than intercultural ones. Below I have outlined several questions commonly asked on this program. Feel free to browse! So what is USIPP exactly? So what about the summer exchange program? The program is about four weeks long, divided into two sections, each two-weeks long in Indonesia and United States. The program takes place in host institutions’ regions as well as additional regions they choose, so there will be lots of traveling in the country as well. Main activities involve lectures, lectures, lectures, and lectures…. Host institutions normally provide several lectures with their professors acting as speakers, and additional lectures with guest speakers. To support the knowledge gained from lectures, participants will visit museums, monuments, and institutions relevant to the issues. There will be discussions held between participants every day (if not forgotten) as well. At times, the program will provide interesting leisure activities as well, such as going to the cinema, and beach, yeay! 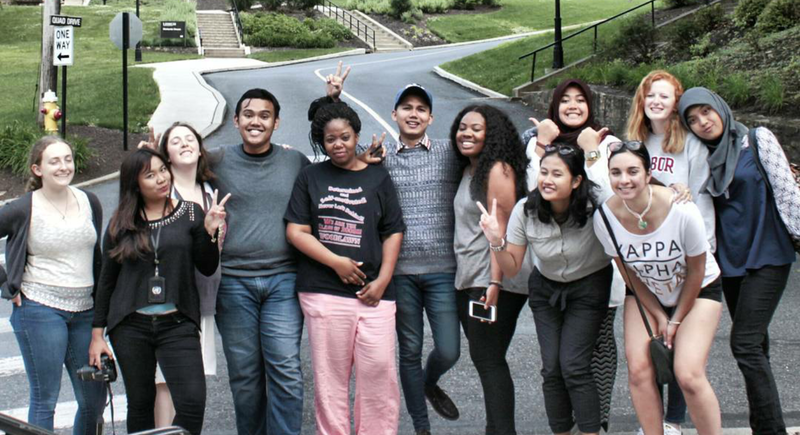 The summer program’s theme is religious pluralism and democracy, but the focus of activities may vary between years. From my experience, the program tried to put balance between the two topics, but the participants’ interests tend to shift to religious pluralism. This summer exchange program is extremely personal that every participants interests and ideas may influence the flow of it. Every plate matters, including my plate. Sadly, though, it is currently still in question whether this program will be continued next year or not. IIE, which provides for the funds in US’ part had ben assessing the USIPP summer exchange for quite some time. Hopefully it will, though. How many students can participate in the summer exchange program? Normally there will be 12 undergraduate students participating in the program, 6 from each states, and two from each university participating. The number in total is deemed to be constant, as Jen, the committee from US part said that it is a ‘magic’ number. The program had tried various number of participants before, but the balance is more easily found with 12 participants, not so small and not so big of a group. In 2016, because there were only five universities participating, the two universities in US had to send three delegates each to complete the number. In Indonesia, however, each university was only allowed to send two delegates. I was one of the two sent to represent Universitas Gadjah Mada in this program. Well I explained how the US’ session is covered with funds from IIE, and the Indonesian part is covered by higher institutions participating. So, practically, the participant would have to pay for nothing but their pocket money! That’s the ideal situation, anyway… It is up to each university to determine the limit of their funds’ coverage. In my case, I had to pay for my travel for legal paperworks and the administration in Jakarta. Some universities, however provide more and the students would not have to pay for anything. The participants can also ask for additional funds if they, creatively, submit funding proposals to their university. To be a participant of the summer exchange, you would have to go through a series of selection process held by your university. It varies for every university, but for Indonesian university it usually consists of written – paperworks stage (essay, TOEFL, academic transcript, recommendation letters, etc. ), interviews, focus group discussions, and final interview. Afterwards, well there will be some paperworks needed to be finished, and that’s it. If you are interested in the program, feel free to ask me personally. I will be posting my each-day experience in the program from tomorrow so that you can learn for yourself. Again, good luck!